NAGTrivia questions are contributed by NAGT members for the NAGT community, with a new question appearing each month in the NAGTNews e-newsletter sent to all members. The trivia questions are a way for members to share their knowledge and fun facts related to the Earth sciences, and they also hold potential as a teaching resource. Check your response to the latest NAGTrivia question below. Not an NAGT member? Join now to gain access to the NAGTNews, NAGTrivia archives, and many more member benefits. Between the establishment of the first National Park in the US in 1872 and the signing of the National Park Service Act (establishing one agency to oversee the National Parks) on August 25, 1916, twelve national parks were created (that are still in existence). How many of those parks are located at the site of active volcanism? This question was contributed by Jennifer Wenner, who has been an NAGT member since 2006. C. Five Correct! These parks include (in order of creation) Yellowstone (1872), Mt. Rainier (1899), Crater Lake (1902), Hawaii Volcanoes (1916), and Lassen Volcanic (1916) National Parks. D. Cape Town, South Africa Correct! This outcrop, called "Sea Point," was visited by Charles Darwin in 1836, towards the end of his round-the-world sojourn on the H.M.S. Beagle. 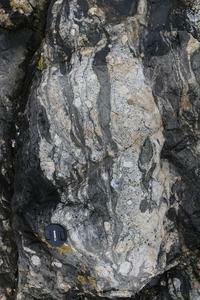 Here, beds of dark colored Malmesbury rock, altered by intense heat, are intermingled and folded with the light colored intrusive granite. Which is the only state to require a credit in Earth/environmental science to graduate from high school? This question was contributed by Anne Egger, Past President of NAGT and current Editor-in-Chief of the Journal of Geoscience Education. D. Mammoth Cave, near Brownsville, KY Correct! Mammoth Cave developed in Mississippian-aged limestone strata capped by a layer of sandstone. It is known to include more than 415 miles of passageways, with new discoveries and connections adding several miles to this figure each year. B. Liesegang Correct! In 1896, a German Chemist named Raphael E. Liesegang first described Liesegang banding in his observations from the results of an experiment. 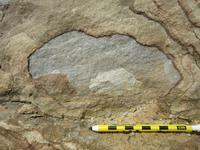 Liesegang rings are distinguishable from other sedimentary structures by their concentric or ring-like appearance. 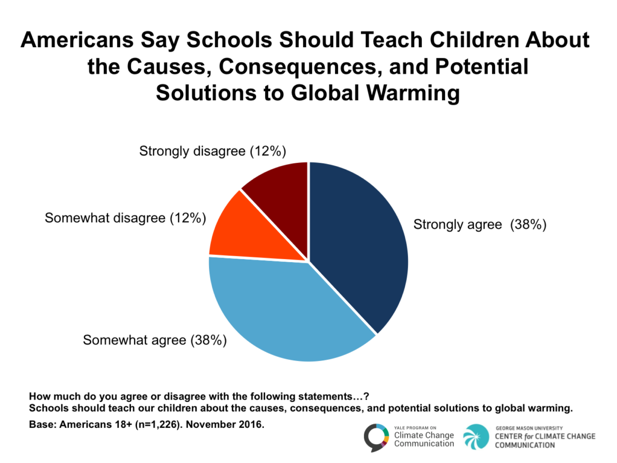 What percentage of American adults think that schools should teach children about the causes, consequences, and potential solutions to climate change? This question was contributed by Karin Kirk, member of NAGT's James H. Shea Award Committee and the InTeGrate and Teach the Earth communities. A. 97% I wish! But, nope, it's not that high. B. 74% Correct! 74% of Americans either somewhat agree or strongly agree that schools should be teaching about climate change. Only 24% disagree that climate change should not be taught in school. As NGSS standards are being implemented around the country, it's nice to know that most Americans agree that climate change is a topic worth teaching. Image source: Yale Program on Climate Change Communication; data from November 2016. N=1, 2226 Americans 18 years or older. Read more about this study. C. 59% Nope, we're doing better than that. D. 43% Thankfully, the situation is not that bad! Which country has emitted the most CO2 over time? In other words, which nation bears the most responsibility for the greenhouse gases currently residing in the atmosphere? This question was contributed by the CLEAN Climate Literacy Quiz. Take the full quiz, or incorporate it into your teaching: click here. B. USA Correct! 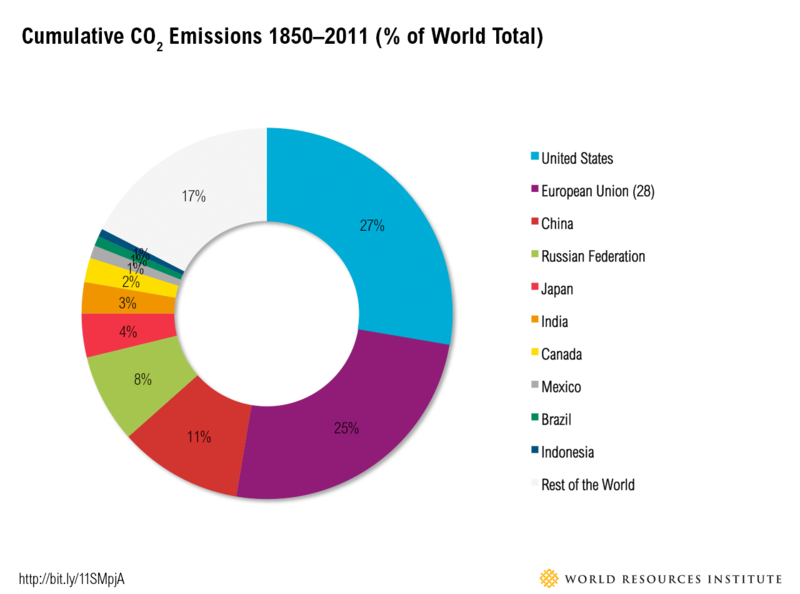 The USA is responsible for 27% of the world's cumulative emissions from 1815-2011. Read a more in-depth explanation and further sources by viewing the CLEAN Climate Literacy Quiz, question 12. Image source: World Resources Institute. Read more about this study. C. Russia Nope, but they are the fourth-highest emitter. D. European Union No, but they are the second-highest emitter, so you are close.